A handful of Microsoft employees, vendors, and spouses play for Emerald City Netball Club in Seattle. The sport, played mostly in Commonwealth countries, reminds many of home. soccer and the ball of volleyball, and you've got netball. Read more here. Think Ultimate Frisbee plus Basketball, and you have NETBALL! Check out the ECNC posting on Sports Blast here. King County's Marymoor Park plays host to "netball", the region's newest team sport. "Netball", a sport with an international following that's just beginning to catch on in the United States... Read more here. Netball seeks to expand its sphere of influence. million women worldwide. Read the rest of the story here. Can you imagine? The lengths some people go to play netball!! 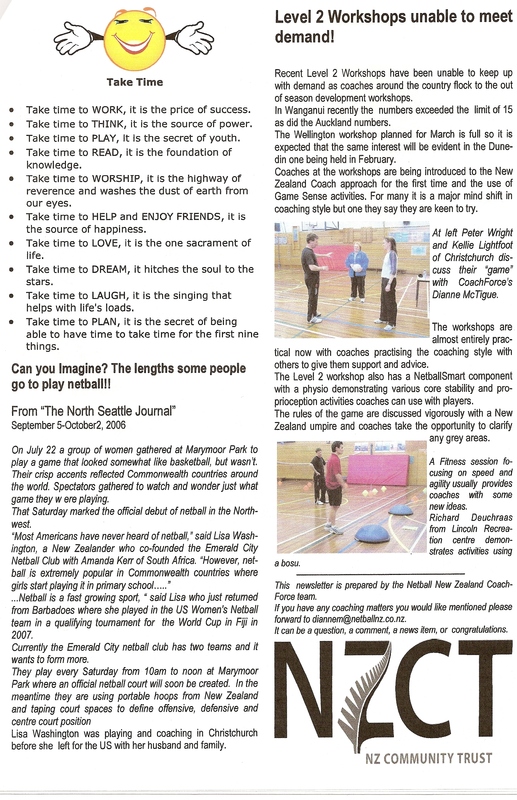 An excerpt from The Seattle Journal article appears in a Netball New Zealand coaching newsletter. What is that game? Netball debuts in the Northwest. On July 22, a group of women gathered at Marymoor Park to play a game that looked somewhat like basketball, but wasn't. Their crisp accents reflected Commonwealth countries around the world. Spectators gathered to watch and wonder just what game they were playing.